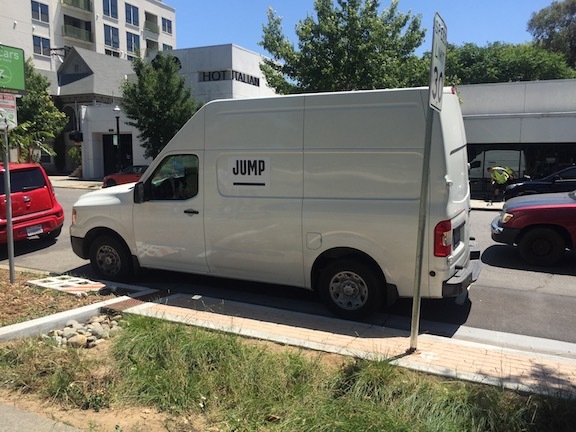 I ran into a JUMP rebalancer at 16th & Q today. Neither of us had much time to talk, but I did gather some tidbits. The warehouse is in West Sacramento. The Tower Bridge Preview (white SoBi) bikes are going into storage, for now. Didn’t ask about the ultimate disposition. He was picking up the SoBi bikes, dead and live ones, so they should all be gone from the hubs soon. Three are job openings working for JUMP here in the Sacramento region. They are listed on Indeed at https://www.indeed.com/jobs?q=bike+share&l=Sacramento%2C+CA. They have a white delivery van for moving bikes. I don’t know if they are moving any bikes with the bike trailer that was used with the Tower Bridge system, but I would hope so. The JUMP warehouse in West Sacramento is in a light industrial area northeast of Del Monte St and Shore St, near the UPS distribution center.